One of the best parts of my job is that I get to explore places like Deerwood Ranch Wild Horse EcoSanctuary near Laramie, Wyoming. It’s one of three wild horse eco-sanctuaries in the country and the only one on private land, so it’s definitely unique. For about six years now, the Wilson’s ranch has been home to 350 wild horses, also known as mustangs. 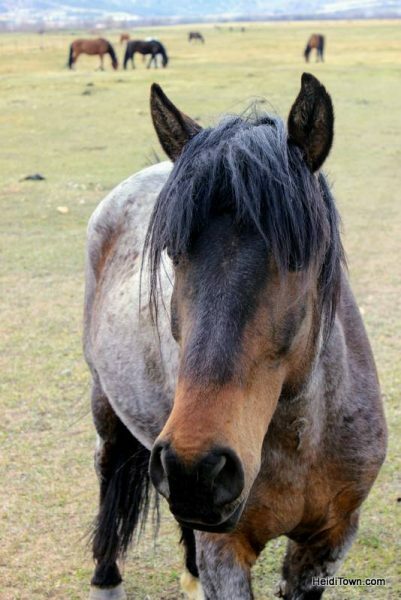 A mustang isn’t a breed, but the name for a wild or feral horse. These horses are descendants of domesticated horses and come in various sizes and colors. The array of colors is startling. At Deerwood, all the horses are geldings, a castrated male horse. 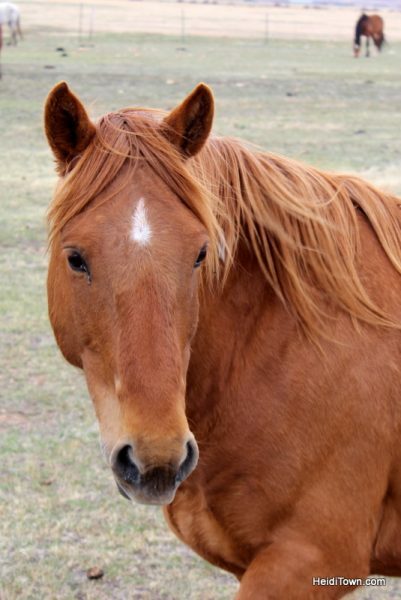 The horses live at the ranch until they die, often a natural death. The Wilsons are not allowed to provide vet services but do provide the horses hay from December through mid-May. 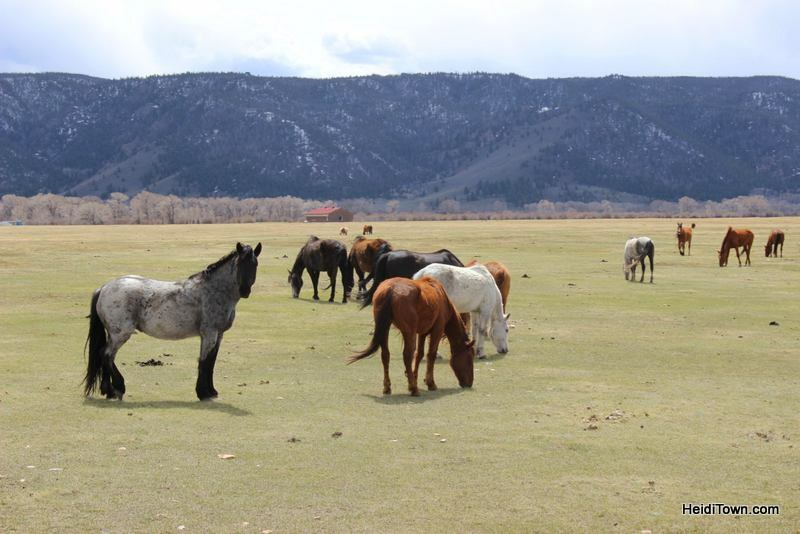 During the remaining months, the horses do rotational grazing on the ranch’s meadows and pastures. There is some controversy surrounding our country’s wild horses and I’m not going to delve into that subject here. 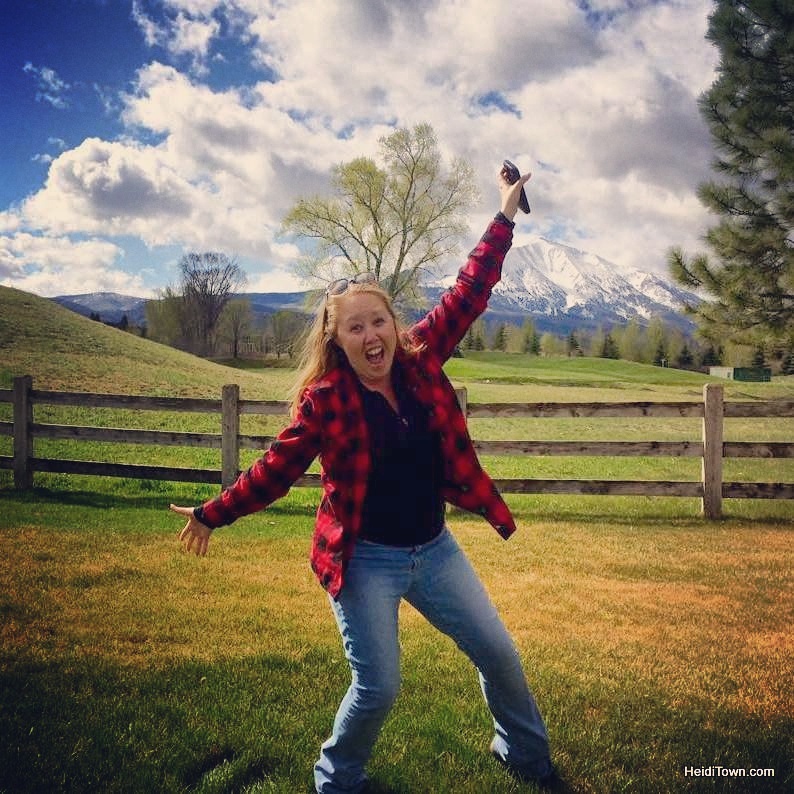 I am simply going to share our experience of touring this fascinating ranch that’s just a two and a half hour drive from Denver. The horse on the left with the dark face is a real stunner. 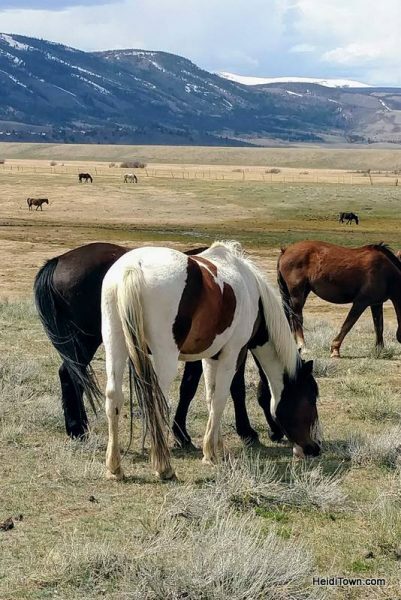 The Wilson family’s nearly 5000-acre ranch has been certified by the Bureau of Land Management (BLM) to care for these wild horses because grazing space in the wild is becoming scarce and these horses reproduce quickly; a herd can double in size every four years (LiveScience.com). They are also hardy and can live up to 40 years (LiveScience.com). Many people do not know that the BLM operates 16 wild horse herd management areas on public properties in Wyoming. Wyoming has the second highest population of wild horses in the country, behind Nevada. 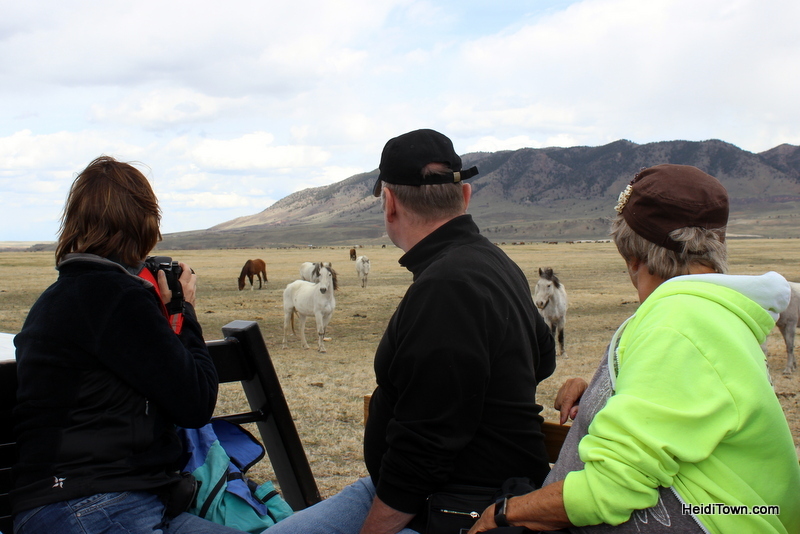 The public can book tours at the ranch and we’d booked a tour during our recent weekend in Laramie. We were staying at Vee Bar Ranch, located just six miles from Deerwood Ranch, so it was an easy excursion to fit into our schedule. Ryan throws rocks for the ranch dogs at Deerwood. Rocks because that’s what they brought him to throw! We arrived at Deerwood a little before our tour time of 2 p.m. and were greeted by a gaggle of tail-wagging dogs. 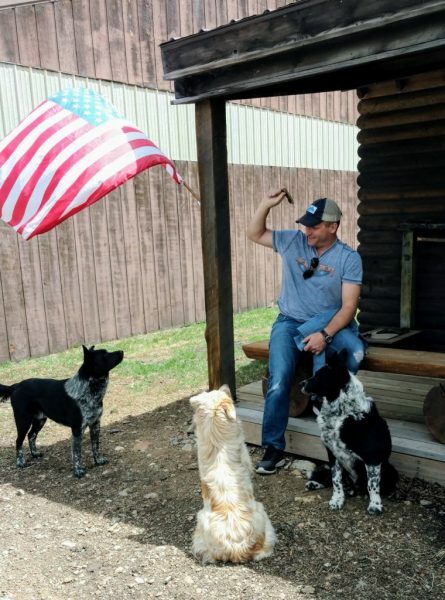 Gus was the old man in the mix, a retired working cattle dog that now occasionally enjoys herding the ranch’s small herd of free-range goats. We were joined on the tour by a group of Germans who were eager to experience firsthand this bit of the American West. We loaded onto a specially outfitted pickup bed and headed out towards the pastures. Rich Wilson drives the truck and his wife, Jana, is the tour guide. 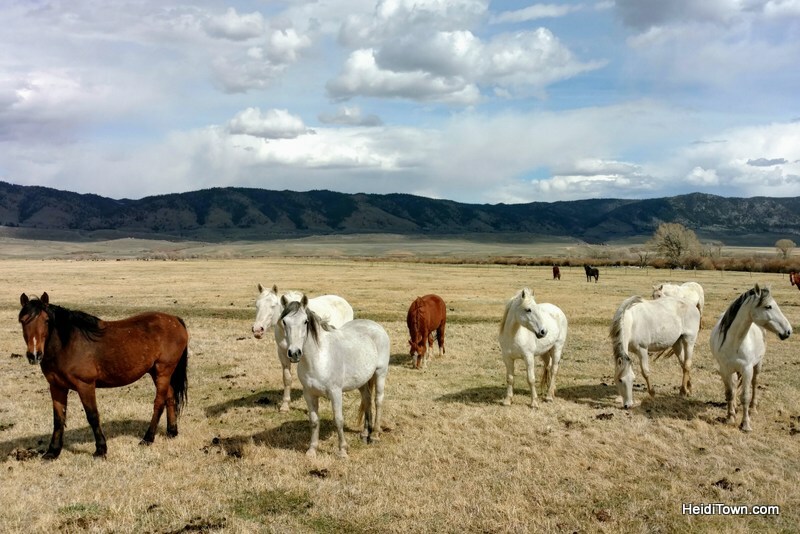 I hadn’t known what to expect on this outing and I was surprised to see that we were driving straight into a huge pasture that was filled with wild horses. As we bumped along, Jana shared entertaining stories, pointing out the few horses that have gained names due to their quirky personality traits or in the case of the horse called Spirit, have been named by children who visited the ranch. One group of children, brought by their grandmother, immediately asked, as they climbed into the bed of the pickup, if Spirit lived on the ranch. “Spirit: Stallion of the Cimarron” is a popular Disney film. Jana told them she wasn’t sure but halfway through the tour the kids spotted a horse that they were convinced was Spirit and the name stuck. This is not Spirit. 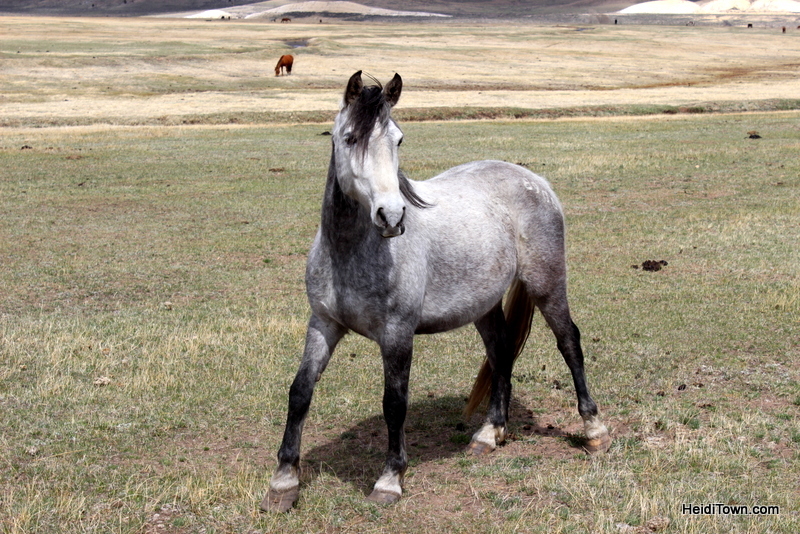 This is a roan that hung out with us for quite awhile and I fell in love with him. While these are unbroken, wild horses, they have become familiar with humans and some are quite friendly. After all, wild or not, these horses descent from domesticated horses and horses have been bred to work and live with humans and while I’m not a scientist, I don’t think that predisposition ever entirely disappears. Jana doesn’t promise that the horses will come up to the truck during the hour and a half tours, but they sometimes do and during our tour, many horses seemed as interested in us as we were in them. Some came right up and enjoyed getting pets while others stood at a distance and gazed at us, perhaps wondering if we had a little hay in our pockets. 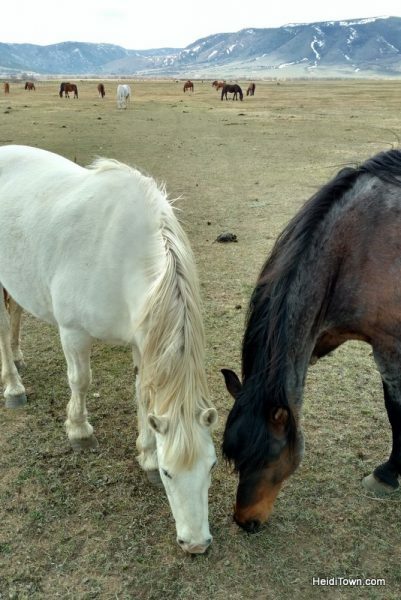 The coloring of the horses is varied with roans, grays, sorrels, buckskins and more. Interestingly, Jana told us that they tend to create groups based on colors, so we’d often spy a group of six white horses hanging out together. We also learned many of the horses have a buddy or best friend as we’d say in human speak. 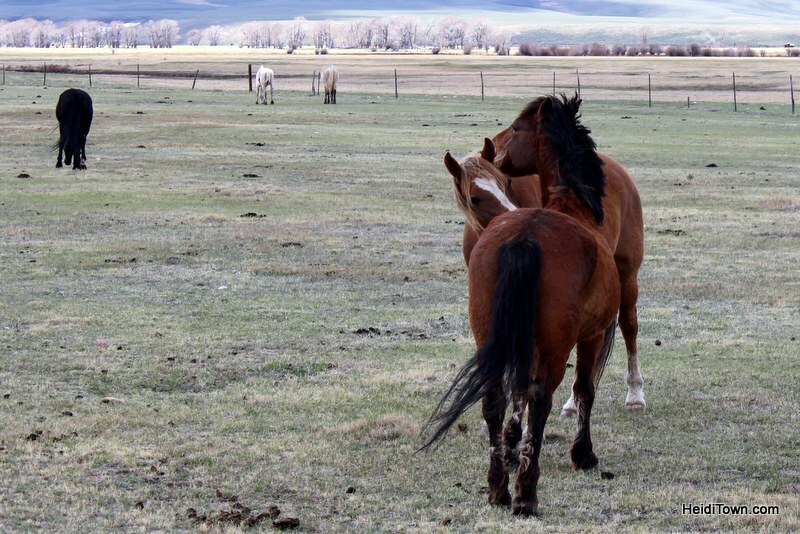 For instance, the ranch is home to a pair of older geldings that can always be found grazing together. Birds of a feather – or in this case, horses of the same color – flock together. Wyoming can be a windy place, but during our visit to the ranch, only a soft breeze was blowing which gave life to all the manes and tails around us. Some of the mustang’s manes were so long they nearly touched the ground. Horses are social creatures and we were all delight to see several scenes of grooming and nuzzling. There’s a sort of peacefulness that comes from being surrounded by these beautiful animals and I enjoy the idea that humans are being stewards of a wild animal that is, after all, here because of us. 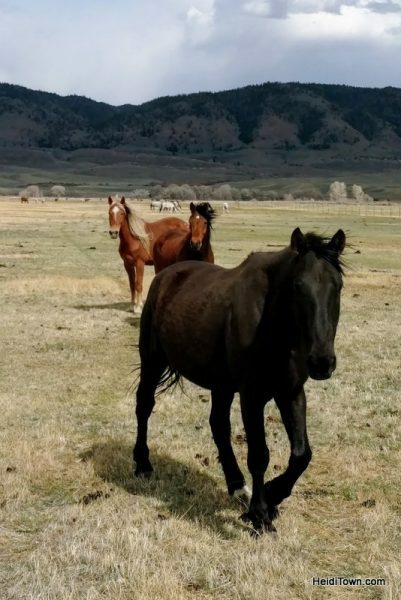 If you’d like to visit the Deerwood Ranch Wild Horse EcoSanctuary, tours run from May through September, but you must make reservations in advance. Tours are $40 for adults and $20 for children 17 and under. More information on tours can be found at DeerwoodRanchWildHorseEcoSanctuary.com. 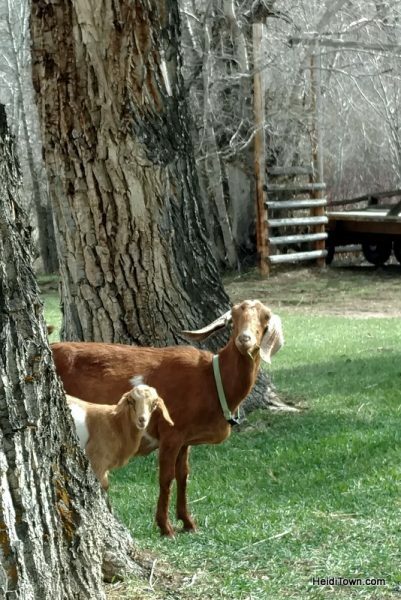 Visit the ranch and say “hi” to the goats! OPEN HOUSE: The ranch is holding a free day for the public on Saturday, June 9, 2018. There will be tractor-trailer tours to visit the horses, a BLM information booth, onsite wild horse adoptions, wild horse training demos and much more. Food will be available for purchase for lunch. The event will run from 10 a.m. to 3 p.m. See more at their Facebook event posting here. It definitely deserves to move up your list, Mandy! Fabulous article and pictures, Mayor! Looks like you’ve been taking a few pointers from your pal, Moose! This place just got added to my bucket list! Ha! I do okay. But in all honesty, I passed the Canon to Ryan so I could shoot with my phone camera and tweet, so many of the photos from that day are his. There’s a combo of both our photos in this post. I’m lucky I married an amazing artist who has a good eye for all things artsy. Thanks for stopping by, Linda. Glad to hear this place is on your bucket list now!